Life is better when your back and spine are pain-free! 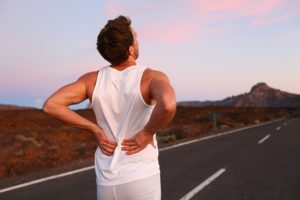 But, often times, people do not consciously think about their spine on a daily basis; however, they quickly realize how important a healthy spine is once they experience neck or back pain. A healthy back requires a lot of attention and care from your side. However, our modern lifestyles don’t always encourage this. Here are a few simple tips to remember in your everyday life to keep your spine healthy and pain-free! Sleep is so important for your entire body’s health. Not getting enough quality sleep may actually worsen inflammation and pain. While most Americans average 6.5 hours per night, our bodies require 7-9 hours of uninterrupted sleep every night. Be sure to maintain a comfortable position throughout the night as well, since poor sleep positions can aggravate back pain. Avoid the tech neck by keeping your phone at eye level. Years of poor posture while using cellphones can eventually lead your spine to curve. A human head weighs around ten pounds. As you tilt your head forward and downward, gravity dramatically increase the weight felt on your neck. Always keep your elbows to your sides, holding the phone up higher to your face, so you can read it while keeping your head straight. Ultimately, you will likely end slouching or leaning during your day. To counter this, take a moment to stretch. Move your body the opposite direction by bending your head back and glancing upward. Roll your shoulders up and down. Take stretch breaks throughout the day. Schedule Regular Visits With Your Chiropractor! Going to the chiropractor makes you feel great, but in reality, it does so much more. Not only will your vertebrae be in better condition, but your body will be able to function better. A healthy spine allows your blood to flow smoothly, your immune system to function properly, and your senses to work better than ever! So give Hill Chiropractic a call today at (405) 341-9885 or schedule your chiropractic appointment online now!